All Blue. All the Time. The Dodger’s season has been over for just over 2 weeks and it was a great season for the rookie manager Dave Roberts. The season didn’t end on the highest note, but it was still a great season. There were many obstacles that they had to overcome with things like Clayton Kershaw being placed on the DL, starters not going much farther than the fifth inning, and inconsistent bats. Dave Roberts battled through it all and led the team to their fourth-straight division title. He also led them to the victory in game 5 of the NLDS against the Washington Nationals by putting Kershaw in the ninth inning to close the game and earn the save. First of all, voting for the 2016 Esurance Awards is still open until November 11, 2016. Vote for the best rookie, best major leaguer, best pitcher, and much more. It is really simple to vote, just select one candidate from each division, fill out the information, and click vote. It’s as simple as that, so hurry up and cast your votes before you run out of time. There are 11 Dodgers who are eligible for free agency this year and resigning them is really important. Closer Kenley Jansen, third baseman Justin Turner, starting pitcher Brett Anderson, relief pitcher Joe Blanton, relief pitcher Jesse Chavez, starting pitcher Rich Hill, relief pitcher J.P. Howell, second baseman Chase Utley, right fielder Josh Reddick, catcher Carlos Ruiz, and starting pitcher Scott Kazmir are all up for free agency this year. I think that it is really clear why Kenley Jansen needs to be resigned, but I will give you the facts anyways. This year Kenley Jansen broke the Dodgers save record and now has 189 career saves. This year he earned 71 saves, received 3 wins, was given 2 losses, and blew only 6 saves. Jansen was the most consistent bullpen pitcher this year and if he leaves it will leave a huge hole. If Jansen decides to go to the free agent market the Dodgers will need to resign him or find another closer from outside the franchise. Justin Turner was the Dodgers’ starting first baseman this year, and he was fantastic. His reflexes are amazing and he saved many games this year. Turner had a solid bat this year, hitting .275 this year, and .285 this postseason. He hit very well against right handed pitchers but struggled against lefties, just like the rest of the team. If Turner decides to use his option to become a free agent, the Dodgers will have trouble finding a new third baseman. They could put Corey Seager at third base and have Charlie Culberson play shortstop, but Seager is so good at the shortstop position that it wouldn’t be a good idea. The other thing that they could do is try to go outside of the franchise for a new third baseman. Even though it is the end of the season, it is not the end of the Dodgers working. The Dodgers front office is already trying to find ways to strengthen the lineup and starting rotation. Will this include signing free agents? Will it be resigning the players who have an option to op-out? Or will it be by trading players? We will not know until it happens, but one thing we do know is We Love LA! Hi there! My name is Micah. I'm a junior in high school and I play on the school baseball team. 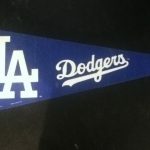 I've had a passion for the Dodgers for many years and I enjoy writing about them. Beyond baseball, I love playing guitar, chilling with my friends, and reading memes. Enter your email address to stay updated on everything Dodgers!